Approximately 60,000 babies are born prematurely each year in the UK - that's 1 in 11 births - and my eldest child, C, was one of them. As a parent of a premature baby I became aware of how difficult it was to find clothing that was of a suitable size, however I had never realised that this same problem would apply to nappies, especially for parents of babies who were born at an earlier stage than C was. Luckily now, the people at Pampers have considered this and have taken action. I had a relatively normal pregnancy with him, everything seemed to be going well except for swelling in the later stages. I assumed that it was just down to me being heavily pregnant and you always heard stories of mothers to be talking about how swollen their ankles had gotten. Neither myself, nor the people around me, noticed how bad my swelling actually was. It wasn't until I reached 33 weeks that I temporarily lost my vision and that scared me into seeking help. I was admitted straight away and C had to be delivered via emergency Caesarean section that evening - I was suffering with severe pre-eclampsia. We were lucky and C was a great size for his gestation. Of course, I was terrified that his lungs weren't developed enough or that he would get sick but he was born crying and went from strength to strength and surprised us all. 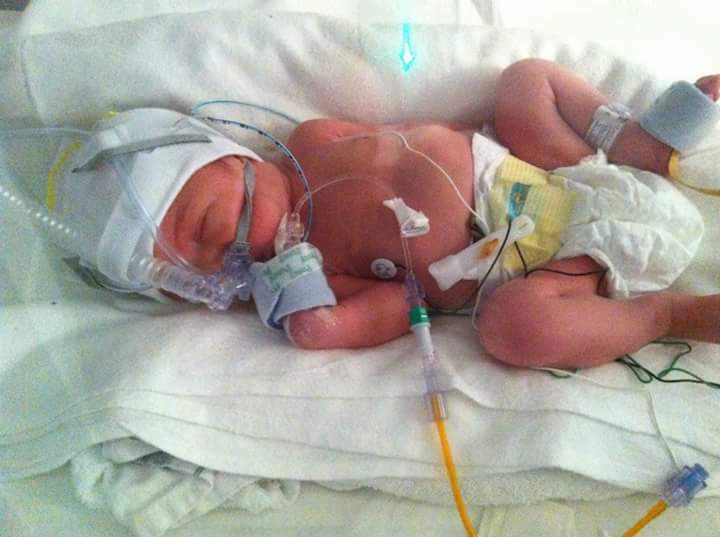 He spent his first weeks in the Neonatal Intensive Care Unit inside an incubator. He wasn't allowed to wear any clothes, only a nappy, and I remember feeling really sad and guilty seeing him hooked up to so many different monitors that were constantly making noises. It didn't help that I didn't know what they meant. I can still vividly hear those beeps to this day. No one expects to have a premature baby so we were obviously very unprepared. Everything I had at home were either newborn sized or 0-3 months and they absolutely drowned him. The hospital provided Pampers micro nappies (for babies 2-5lb) for C to wear, as you can see in the photographs in this blog post. These were the smallest available size and they were still a bit loose on him. We actually had to fold the top down as you can see below. 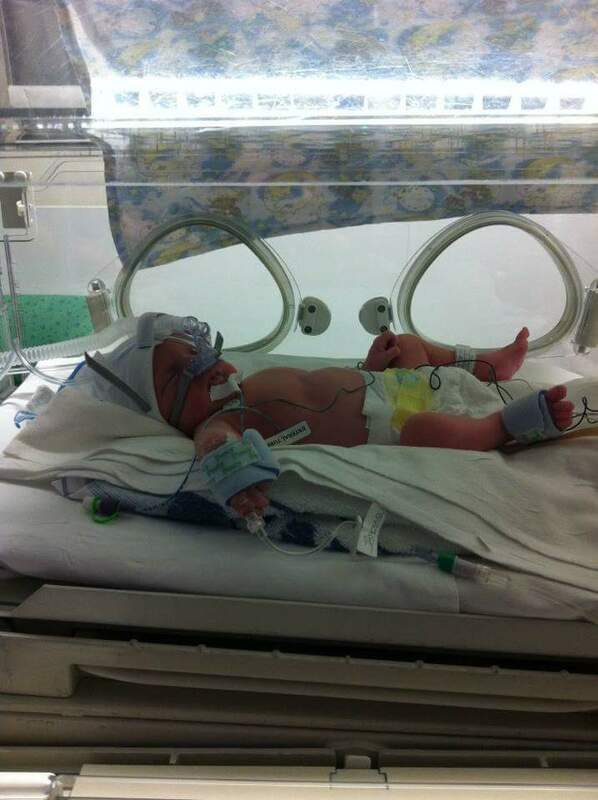 C weighed 4lbs 10.5oz which was quite good for a preemie. Smaller babies would have had to wear nappies that had been cut or folded which obviously wouldn't be as comfortable or may even have hindered their leg and hip development, but what else can you do in that situation when nothing else fits? The healthy development of all babies (even the tinest ones) is something that Pampers are committed to. 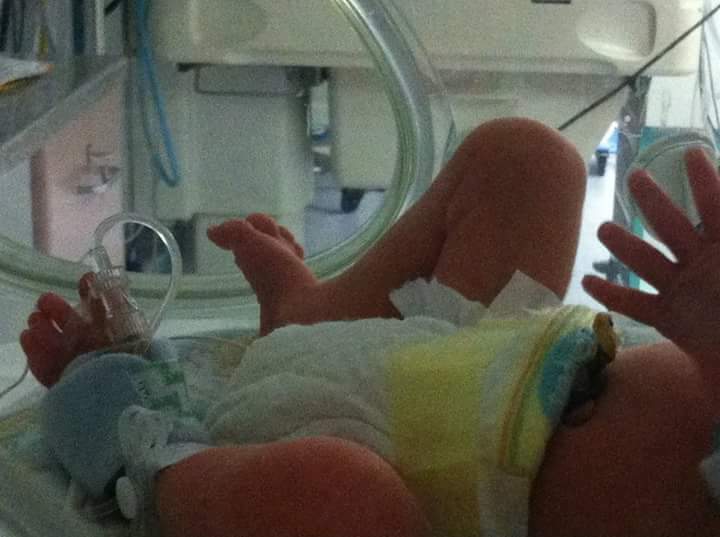 For the last three years, Pampers have been developing the Preemie Protection Range Size P3. This nappy is designed specifically to meet the needs of the tiniest little fighters, even smaller than C! It's three sizes smaller than a regular newborn nappy and is suitable for babies weighing as little as 1.8lb (800g). It even fits in the palm of your hand. We had issues with regular newborn nappies being a little big on C so on a smaller baby it could be too wide and may cause discomfort. Due to the better fit of these new P3 nappies, it would be easier for the babies to sleep, move and receive medical care. Pampers will be donating 3 million of these nappies to Neonatal Units in hospitals all across the UK meaning that every premature baby will have access to nappies designed for their needs. They have also partnered with Bliss, the UK's largest premature baby charity. I hold Bliss very close to my heart as they provided us with little pack of leaflets and samples when we eventually got to bring C home. I also write about them every year on World Prematurity Day. Pampers would love to see photos of your little ones supporting these tiny little fighters. All you have to do is share a photograph of your child or children with a clenched fist to celebrate the amazing fighting spirit that these tiny babies have. For every photograph shared on social media with the hashtag #powerofbabies, Pampers will donate £1 to Bliss. This is a sponsored post in collaboration with Pampers.